Shadows—the absence of direct light—might seem a rather unpromising subject for photography. And yet it is the absence of light in one place that accentuates its presence elsewhere. Indeed, this section could as well have been entitled sunbeams and shadows. One of the delights of exploring shadows in air and water is the fact that they are now three dimensional: rather than merely being a dark area on a surface, they are now dark volumes in space. This can result in some unexpected twists in the interpretation of what one is seeing. For example, the sunlight, and thus the shadows it casts are all parallel. Yet, to the eye which is not very good at judging distance on this scale, the sunbeams seem to diverge from the Sun, sweep across the sky past the observer and then converge on the head of your shadow (the anti-solar point). This impression of diverging and converging is merely the result of perspective—but the impression of radiating sunbeams and shadows is compelling. 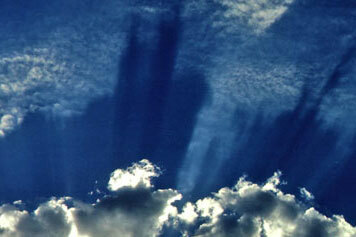 These sunbeams and shadows passing through the atmosphere are called crepuscular rays. The adjective, crepuscular, which just means twilight, results from the fact that the phenomenon is most commonly seen when the Sun is low in the sky, and mountains or clouds can cast long shadows across the haze. 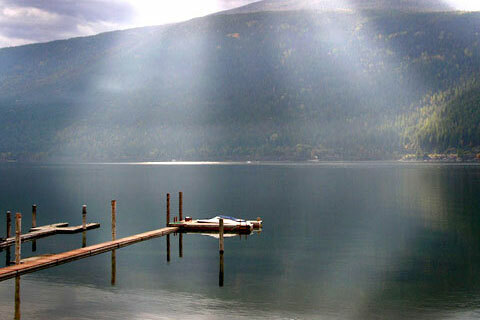 Ironically, while such scenes are often striking, for the shadow to be seen, the air needs to be somewhat turbid, but around Kootenay Lake, the air and water are so remarkably clean that crepuscular rays are subtle and infrequent. One image on this page links to the movie of a shadow of the north shore mountains climbing the south shore as the Sun sets. 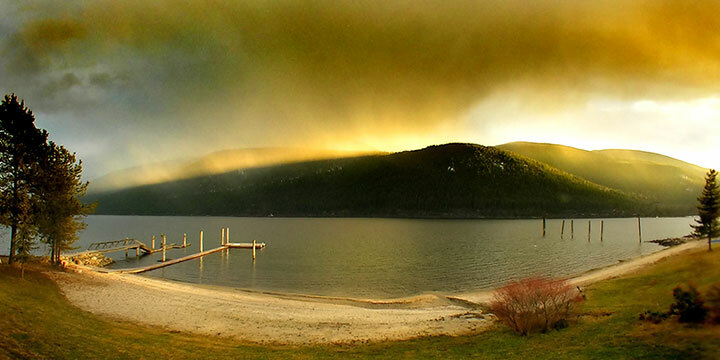 A shower drifting east along the West Arm provides the backdrop for the sharp transistion between light and dark. A col on the ridge (centre) just east of Laska Creek carves out a sunbeam to illuminate the falling snow. As the Sun is low in the western sky, both beam and shadow slope gently toward the Lake (left). Click to load movie in a separate window. Crepuscular rays A touch of smoke in the air from slash burning on the Main Lake provides just enough turbidity to enable one to distinguish between the shadows cast by the clouds and the sunbeams in between. Although the sunbeams are coming towards us, they seem to be painted on the backdrop of the south-shore mountains and so appear to diverge from the Sun. The reflection of these crepuscular rays in the calm surface of the lake adds a pleasing symmetry. Contrail shadow As this aircraft contrail has better contrast than the wave clouds, it is easily perceived as being closer to us and so at a lower altitude than the clouds. 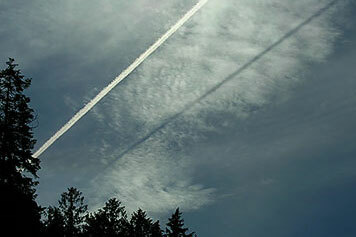 Yet, as the contrail is casting a shadow on the clouds, the contrail is clearly higher. In the atmosphere, even relative distances are sometimes difficult to determine. Confusing geometry When it comes to shadows in the atmosphere, appearances are often deceiving. In this picture it seems as if the shadows for the lower clouds are been cast up onto the higher clouds. Yet, this cannot be for the Sun is above the horizon and so all of the sunbeams and shadows descend, not ascend. A confusion has been made between the angular elevation and altitude: the clouds at the bottom of the picture (small angular elevation) casting the shadows are at the highest altitude, while those at the top of the picture (large angular elevation) receiving the shadows are actually at a lower altitude. Fun, eh? Anti-crepuscular rays converge on the anti-solar point Crepuscular rays which (appear to) diverge from the Sun sweep across the sky passing over one’s head and (appear to) converge on the anti-solar point: a spot which is directly opposite the Sun and the head of one’s shadow. 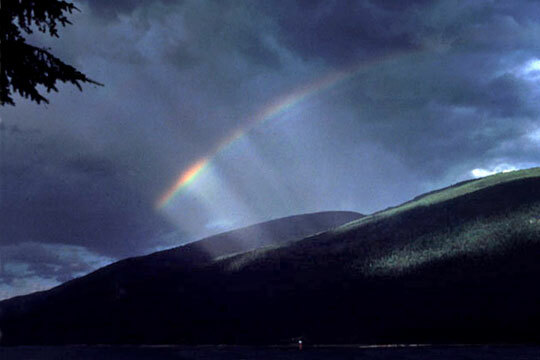 As the anti-solar point is also the centre of the rainbow, the rays give the impression of spokes on a rainbow wheel. Anti-crepuscular rays in turbid water It matters not whether there is air or water, anti-crepuscular rays converge on the head of one’s shadow. 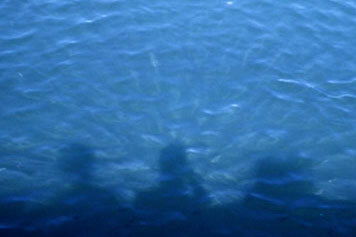 This picture was taken by the middle person; others saw rays converge onto their own shadows. The bright and dark rays are caused by wave crests and troughs which, respectively, focus and defocus sunlight on its way to the anti-solar point. The water must be slightly turbid (neither clear nor murky), and with gentle waves. 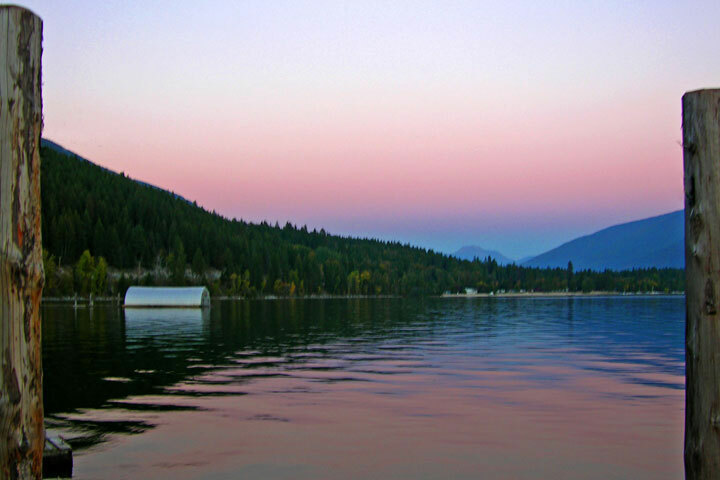 This was taken on the Main Lake in the late 1970s, when phosphates dumped in the upper Kootenay River increased the Lake’s biota. Such a sight is now rare—the Lake is just too clean. For those who delight in a grand sunset, the temptation is to look west. As often as not, I will look east. For as the Sun sets in the west, the shadow of the Earth rises in the east. Here the Earth’s shadow is seen as the region of dim blue light above and to either side of Sphinx Mt. 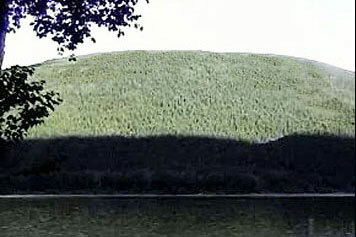 (east of the Main Lake, in the Purcells). Above the shadow, is a pink to salmon region called the anti-twilight arch. This is sunlight which has travelled a long way through the atmosphere passing above the observer’s head and on to the east. Most of the light with shorter wavelengths has already been scattered out and so only light with longer wavelengths remains to be scattered back to our eyes. Of course, the reflections of the shadow and arch in the Lake add to the delight.